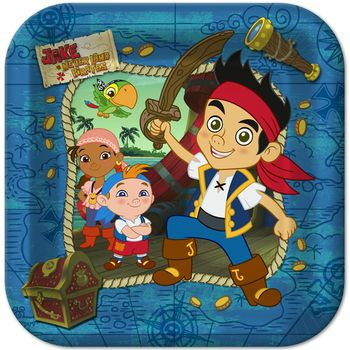 Yo ho ho, lets go on an adventure with Jake and the Never Land Pirates. You will be a jolly buccaneer when you see our fantastic selection of tableware, decorations, and party favors. Disney Jake and the Never Land Pirates Birthday Party 9" Square Lunch Plates, 8ct. Navy Blue 7" Square Lunch Plates, 18 ct.
Disney Jake and the Never Land Pirates Birthday Party Lunch Napkins, 16ct. Navy Blue Rectangular Plastic Tablecloths 54" x 108"
Etched Lillian Gold Plastic Teaspoons 48ct. Etched Lillian Gold Plastic Forks 48ct. Etched Lillian Gold Plastic Knives 48ct. Disney Jake and the Never Land Pirates Birthday Party Invitations, 8ct.